LONDON - November 20, 2009: Volkswagen's most powerful and fastest accelerating derivatives of the Scirocco and Golf ever produced will soon be available. Developed by Volkswagen’s special projects wing, Volkswagen Individual, prices for Scirocco R start at £26,945 on-the-road and £28,930 for the Golf R.
Fitted with a 2.0-litre TSI four-cylinder engine and a six speed manual gearbox as standard, the Scirocco R develops 265 PS and 258 lbs ft of torque while the Golf R produces 270 PS and 258 lbs ft of torque. A six-speed DSG gearbox is available as an option on both models from £1,300. For the first time on an ‘R’ model, the Scirocco R channels power though the front wheels and is fitted with the XDS electronic cross-axle traction control system to ensure improved grip in all conditions. The Golf R, available in both three- and five-door bodystyles, uses a pre-charged hydraulic version of Volkswagen’s 4MOTION four wheel drive system. This system can react quicker than previous 4MOTION systems while also limiting torque to maximise traction and minimise wheelspin. The range-topping Scirocco accelerates from a standstill to 62 mph in 6.0 seconds, falling to 5.8 seconds when equipped with the DSG gearbox, while achieving a combined figure of 34.9 mpg (35.3 for DSG) and 189 g/km of CO2 (187 for DSG). The Golf R is the fastest accelerating Volkswagen ever produced, with a 0 to 62mph sprint taking just 5.7 seconds. As with the Scirocco, the DSG gearbox shaves a further two tenths of a second from this time. Despite this impressive performance, the Golf R returns 33.2 mpg on the combined cycle (DSG 33.6 mpg) and CO2 emissions of 199 g/km (195g DSG). 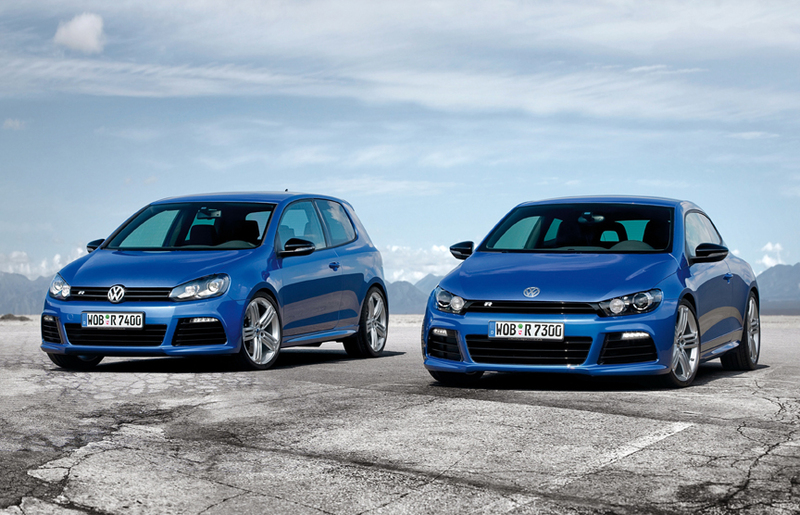 Both the Scirocco R and Golf R models have a top speed of 155 mph. To set the ‘R’ models apart from a conventional Scirocco or Golf, both feature unique styling features. New front bumpers complete with LED running lights and a trio of deep airdams, Xenon lights which frame gloss black grille elements, gloss black wing mirrors, sill extensions and 18-inch five-spoke ‘Talladega’ alloy wheels housing gloss black ‘R’ callipers give the new models a purposeful look. Optional 19-inch alloy wheels in the same design are also available and, on the Golf R, these can be specified with a gloss black finish. At the back, both models feature roof mounted spoilers and are fitted with twin exit exhausts; the Golf R’s positioned in the centre of a gloss black diffuser and the Scirocco R’s mounted on either side. Smoked rear light units, which on the Golf house high-intensity LED bulbs, further differentiate the R models. Styling changes continue inside the cabins of both new models with new sports seats complete with ’R‘ logos, piano black and silver highlights, a new three-spoke black leather sports steering wheel with contrasting stitching and revised white backlit dials with subtle electric blue needles unique to the ‘R’ range. Vienna leather sports seats are available on both models and Recaro bucket seats can also be specified as an option on both the three- and five-door Golf R models. Alongside the new addition to the Scirocco range, the power output in the ‘standard’ 2.0-litre TSI Scirocco GT has now been increased to 210 PS. This extra power reduces the sprint to 62 mph to 6.9 seconds for both the manual and DSG gearboxes, and top speed increases to 149 mph (147 DSG). Fitted with revised oil and cooling systems, the 210 PS unit also boasts improved fuel consumption of 38.2 mpg (was 37.2) and emissions of 172 g/km of CO2 (was 179) over the engine it replaces.